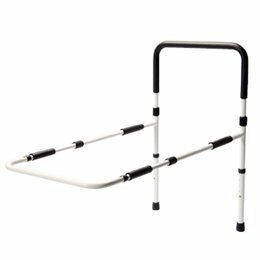 Bed Support Rail - Bed Support Rail - Model 565653 by Sammons Preston at Doctor Joe Says. Hurry! Limited time offer. Offer valid only while supplies last. Allows a person to get in and out of bed easily and safely. Simple to assemble and adjust for height and depth; no tools needed. Fits most size beds. Allows a person to get in and out of bed easily and safely. Simple to assemble and adjust for height and depth; no tools needed. Fits most size beds. Depth of underbed frame adjusts 34"Ð 45" under mattress. Support rail quickly adjusts in height from 31"-37".Weighs only 7 lbs. and has a 250-lb. weight capacity. Depth of underbed frame adjusts 34"-45"